Welcome to the The Third Annual MBIP Invitational Miniature Golf Tournament! Before this year’s tournament begins, I thought we’d go and pay our respects to the miniature golf course that was the home for the first two tournaments. Wee Tee was Peoria’s beloved miniature golf course for 68 years. Last year it closed and OSF is now building a health-care center for children here. You can see photos from the last day at Wee Tee by clicking here. I noticed the rocks in the parking lot and picked up a few for tonight’s tournament. Sad to see Wee Tee gone, but times change and we must keep moving along! We decided to come to Mt. 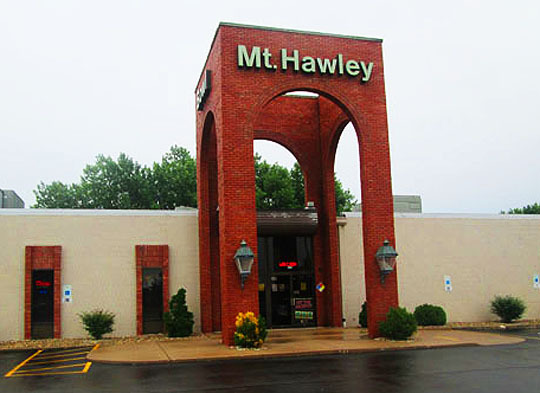 Hawley Bowl for this year’s tournament. Let’s go inside and take a look around. They have 24 lanes of bowling, an arcade, food and best of all, a bar! I stopped in to Kingpins for a pre-tournament beer and Bill served it up! This is a friendly place and you can see more photos of the bowling alley and Kingpins by clicking here and here. It’s really nice in here, but we’re not here to bowl or hang out at the bar, we’re here for miniature golf, so let’s go take a look at the course! It’s called Castle Miniature Golf Course because there’s a 30 foot castle in here! It’s really a beautiful 18 hole miniature golf course with bridges, lakes, stone walls and a fun atmosphere. Okay, time to meet the golfers! It’s the same crew as last year and we are from left to right: Yours Fooly, Jon, Amber, Joe and Adam. Here’s a photo of the two champions from last year’s tournament. Jon was the champion and Amber was the runner up. Can they hold on to their titles? Keep on scrolling to find out! No, not that kind of tea you silly Beatles! And yes, this joke never gets old, at least not for me! Time to get this tournament into action! It takes balls to play miniature golf, so we each selected a color. I try to stay away from the blue color whenever I can! Buzzy handed out the golf clubs and we headed out the back door to the 18-hole golf course. There’s the golfing rules and we’ll just pretend like we didn’t see rule number one and keep moving along here! Here we go with the first swings on hole number one. Adam got the first hole-in-one right off the bat! He said he had been practicing and it looks like it’s paying off already! Attack Of The Satan Children! A flock of screaming Satan children appeared out of nowhere, so we took a little break and let the little devils play through. Okay, back to the tournament already in progress! It had rained earlier, but the weather cleared up and it’s a perfect evening for miniature golf! Uh, oh, looks like the Satan Children left their mark on the sixth hole! We’re at the midway point after the ninth hole and Adam has the lead. There’s a three way tie for second place and of course, I’m in last place as always! I really like this miniature golf course and it’s nice to keep this tradition alive here! There’s the giant castle and we’re getting near the end of the tournament! This is the 18th hole and Amber got a hole-in-one here, congratulations, Amber! We started out with a hole-in-one and we end up the same way! Adam is the 2018 MBIP Miniature Golf Champion! And Joe is this year’s runner up, congratulations to both of them! We went back to Kingpins for the awards ceremony. Adam got the top prize which is a bowling trophy from 1967! Both Adam and Joe got Wee Tee t-shirts in honor of the first two tournaments. Both the trophy and t-shirts were from Urban Artifacts, the home for all your bowling trophy needs! Jon came in third place and Amber and I tied for last place. Thanks for joining me in the loser’s circle this year, Amber, it’s not quite as lonely this way! We’re holding our prizes which are rocks from the Wee Tee parking lot. 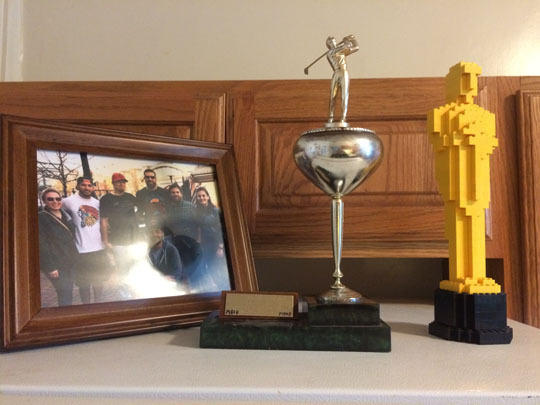 Adam sent me photo of the MBIP 2018 Bowling Trophy in a place of honor on top of his refrigerator next to his Lego Oscar statue! Very cool! Thanks to everyone at Mt. Hawley Bowl for hosting this year’s tournament and thanks to Amber, Joe, Jon and Adam for a fun tournament and for being great sports! Looking forward to next year’s tournament already! 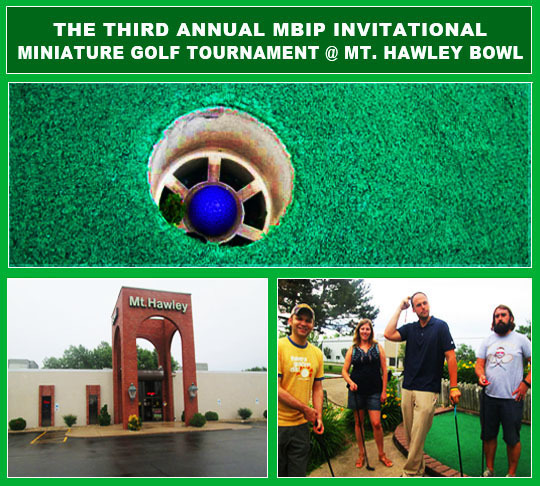 Related Posts: The First Annual MBIP Invitational Miniature Golf Tournament and The Second Annual MBIP Invitational Miniature Golf Tournament.